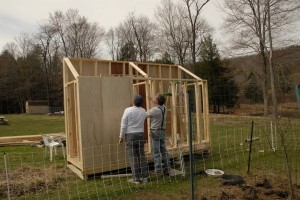 April 14 2009 we started the construction of our new chicken coop. 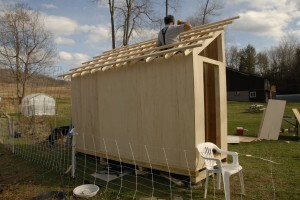 The original plans for this coop were featured in a previous blog. I mention them now because we have been modifying our plans as we go along and I am not sure how close to my original idea we will be in the end. 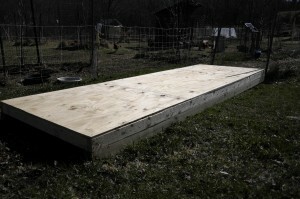 Gerald, my husband has been coming home from work as early as he can to work on the coop. The first day he constructed a base on two pressures treated 4” x 4”s. 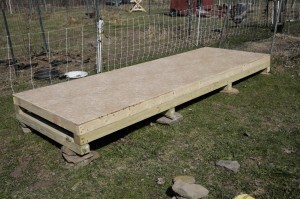 The base is a rectangle 4” x 12” made out of 2” x 4” boards with 2” x 4” boards running across the rectangle covered by 1 and ½ pieces of 4’ x 8’ sheets of plywood. So far this matches the original plans. 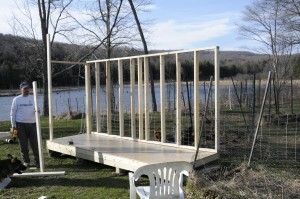 My sister-in-law Cindy recently had a chicken palace build by a carpenter. She had her floor covered in linoleum. I had read about using linoleum for the floors. It is supposed to make cleaning the floor easier so we went to Endwell Rug in Endwell NY and bought a 12’ x 4 ½’ remnant for $25.00. This is the first change to our plans. 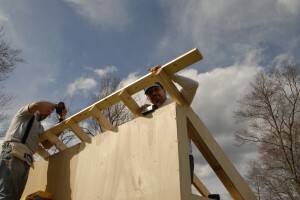 On April 17th our Friend and neighbor Brad Meyer (Meyer Mountain Farms) came down to help with the construction. 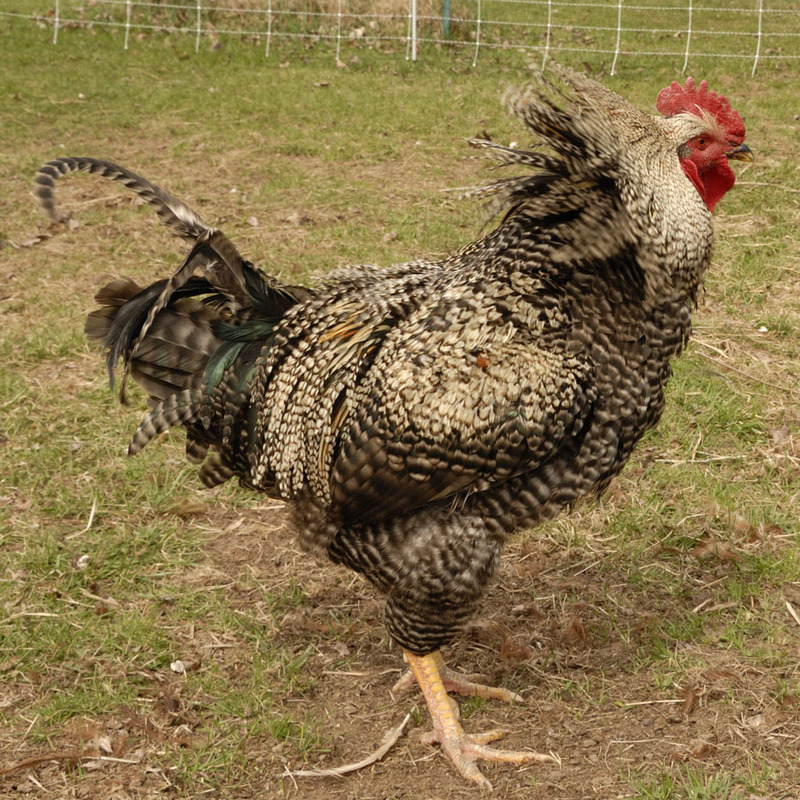 He has much more experience than we do and very nicely made some suggestions which resulted in some improvements to our coop plans. Instead of framing out two big openings for two nesting boxes, we decided that the openings to the individual boxes will be between the 2” x 4” studs in the walls. We will hang the nesting boxes off of the outside of the coop wall with the openings in the boxes lined up with the spaces between the studs. Brad says that the walls will be stronger this way and it will be easier to construct. The next change is in the height of the coop. My original plan was for 4’ high walls on one side and 6’ high walls on the other expecting to have to crouch some when I step into the coop to clean it. Now the walls are going to be 6’ on the short side and 8’ on the tall side. No crouching and fewer cuts in the lumber. Once the walls were framed up we stood them up and screwed them to the base. With all of the walls up we put siding on the walls and then the rafters for the roof. It took 8 hours to get this far. 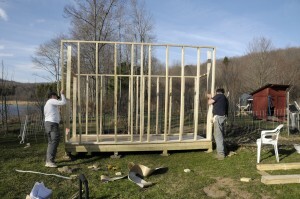 The base built on the 14th, the walls built on the 16th and the siding and rafters put up today the 19th. We plan to get together again after work on Tuesday the 21st to continue working on the project.